Saint Mother Frances Xavier Cabrini is dressed in black and blue robes with open hands. 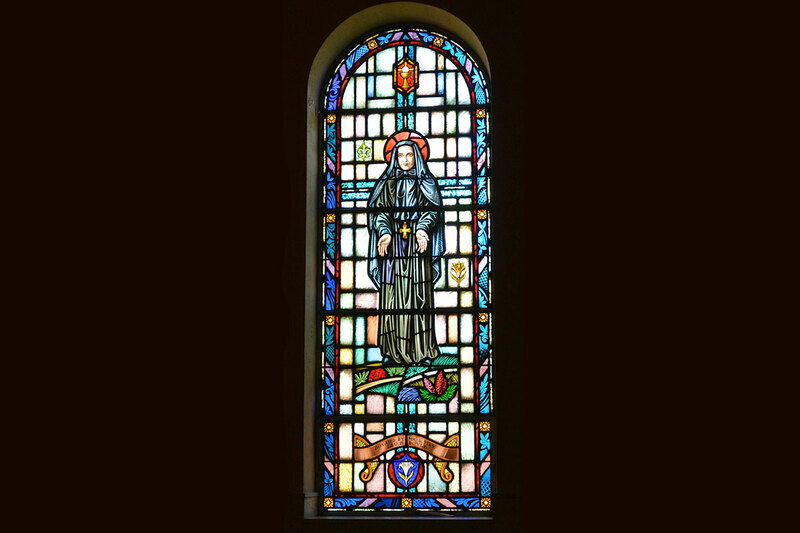 She founded the Missionary Sisters of the Sacred Heart dedicated to helping Italian immigrants. She was the first US citizen who was canonized. Her feast day is November 13. Pray to her for help in taking care of those from another land. 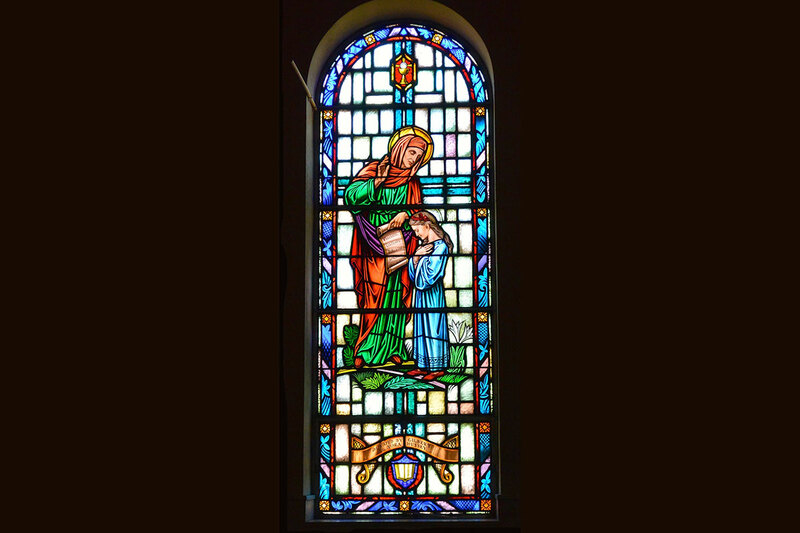 St. Anne with daughter St. Mary as a child. Her feast day is July 26th. The Church teaches us that parents are the primary teachers of the Faith to their children. Pray to St. Ann to be a good teacher. Grandmothers, pray to her also for wisdom as she was the Grandmother of Jesus. The Sacred Heart of Jesus, the Patron of our Parish. 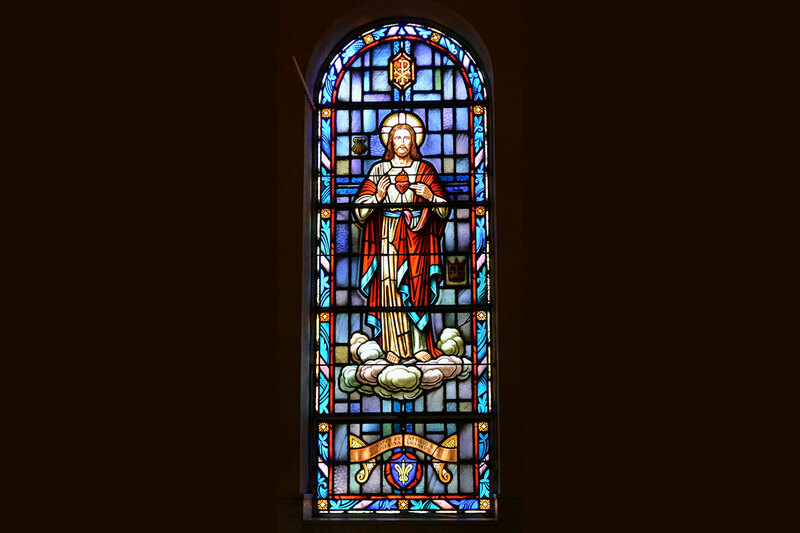 In honoring Jesus’ Most Sacred Heart, He promises in return to give families peace and to make “tepid souls fervent”. Pray to the Sacred Heart for all our family members who are away from Jesus and His Church. The Feast of the Sacred Heart is 19 days after Pentecost on a Friday. St. Rose of Lima, a Peruvian nun and mystic who led a life of penance and prayer in caring for the sick and elderly. Her feast day is August 30. May we also, dear Jesus, take care of our sick and elderly with great compassion as did St. Rose. St. John the Apostle is dressed in red and green robes, holding a quill pen and scroll. His feast day is December 27. St. John wrote the Gospel of John and the Book of Revelation. He was the only apostle not martyred. Jesus asked John to take care of His Mother as He died on the Cross. Let us also pray to take good care of our mothers. 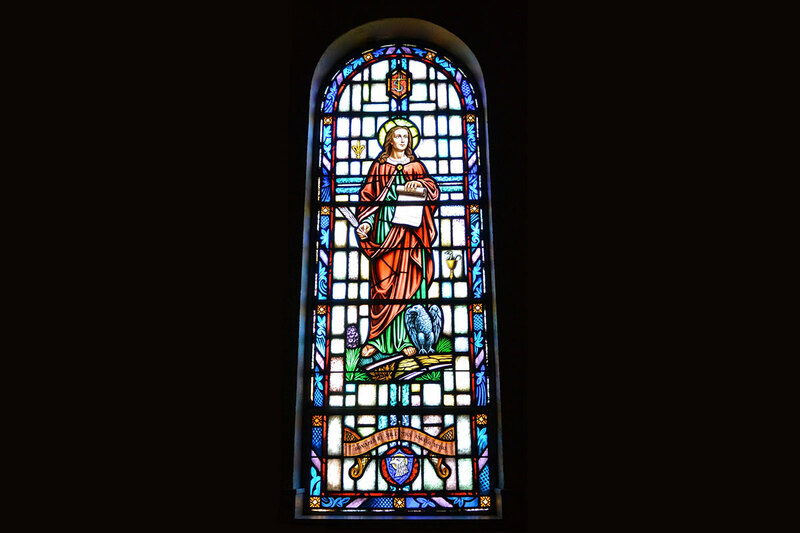 Also known as St. John the Evangelist. 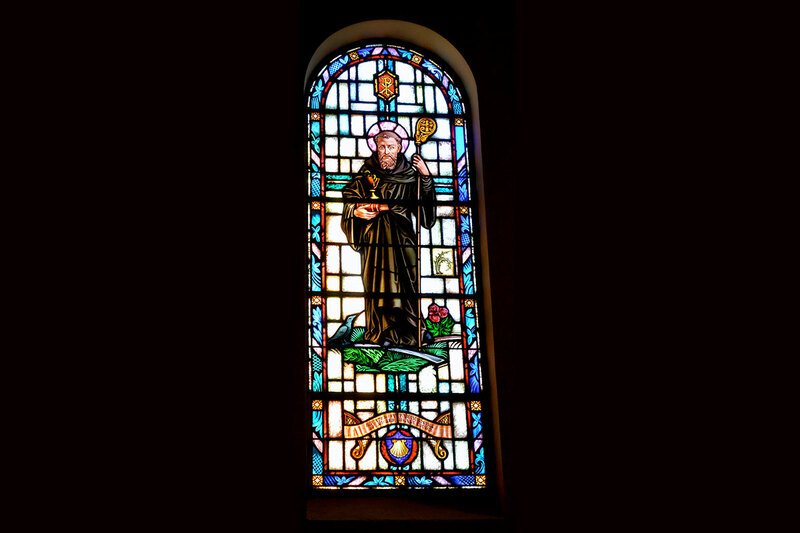 St. Benedict is dressed in traditional brown robes of a monk, holding a closed book and a chalice with a snake. He was a great innovator setting up the first communities of followers, the Order of St. Benedict, and giving them “The Rule” to live by. This Rule consisted of primarily prayer, known as the Office, and reading the Bible using Lectio Divina. 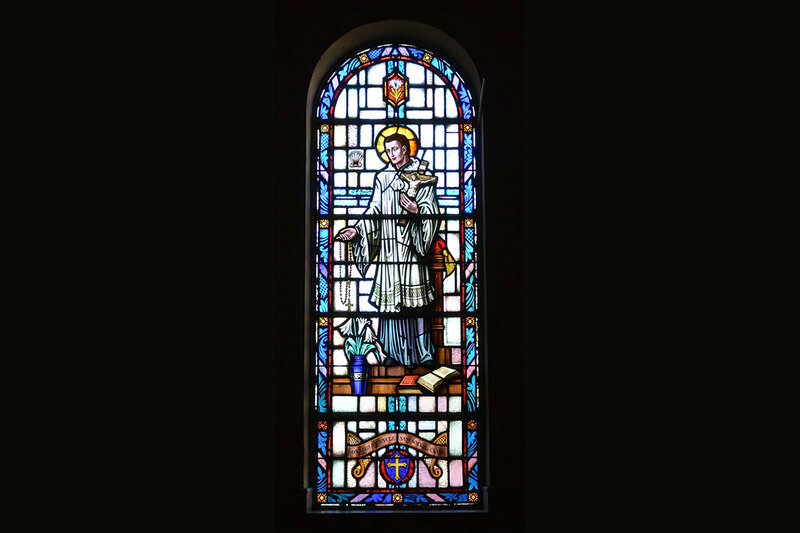 His feast day is July 11. He is the patron saint of Europe and the St. Benedict medal carries with it many protections. St. Patrick, bishop, is dressed in green vestments holding his staff. 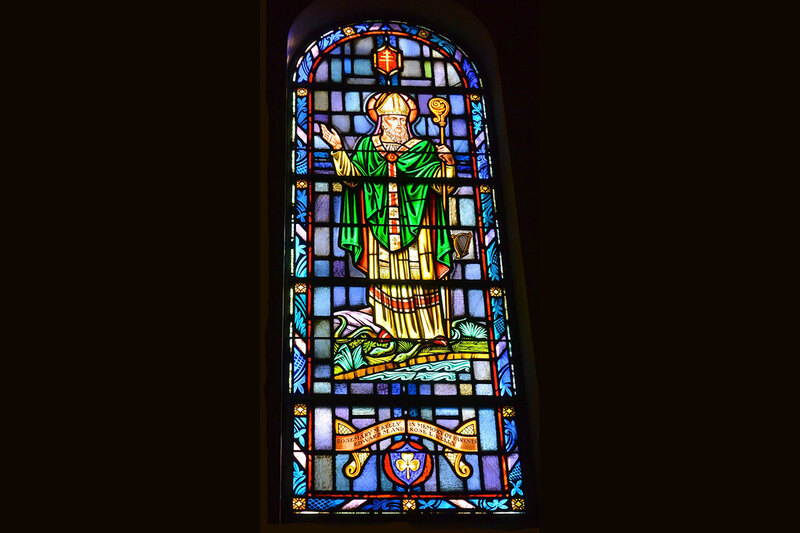 Born in Great Britain, he became a missionary to Ireland where they have taken him as their patron saint. His feast day is March 17. Pope St. Pius X is seen here dressed in the traditional Papal tiara and white robes. Devoted to the Blessed Mother, his motto was “Renew all things in Christ” through Mary, and promoted frequent communion. His feast day is August 21. 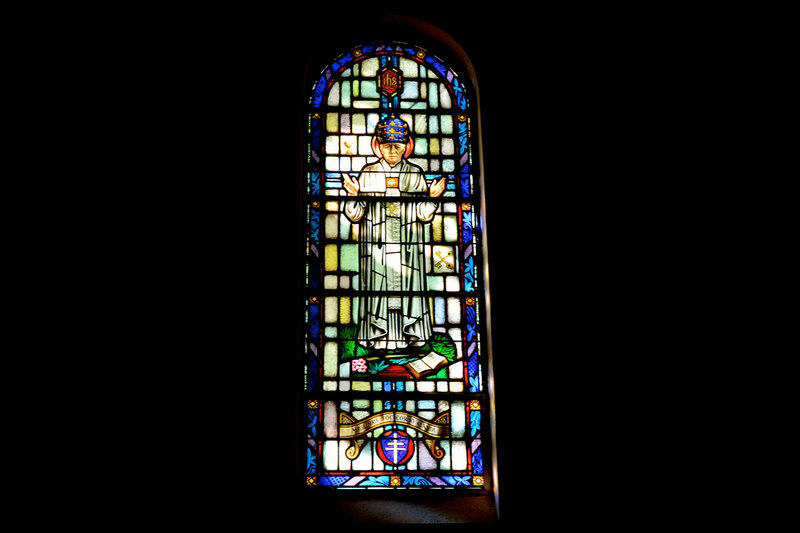 He is the Patron of First Communicants and those on religious pilgrimages. 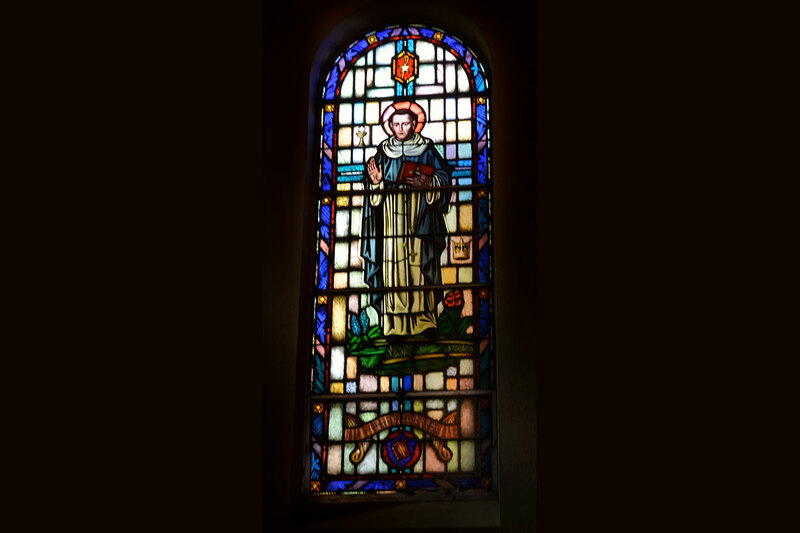 St. Thomas Aquinas is dressed in the white robes of the Dominicans holding The Summa Theologica, which he authored, and the Rosary. He is an Italian friar who received the title of “Doctor of the Church” for his great writings on philosophy and Church teaching. He is the patron saint of professors, philosophers, students and especially apologists (those who defend the faith). His feast day is January 28. St. Genevieve, dressed in blue and red robes, is holding a bouquet of lilies representing perfection, light and life. Praying that Attila would not attack the city of Paris, Attila suddenly changed course. 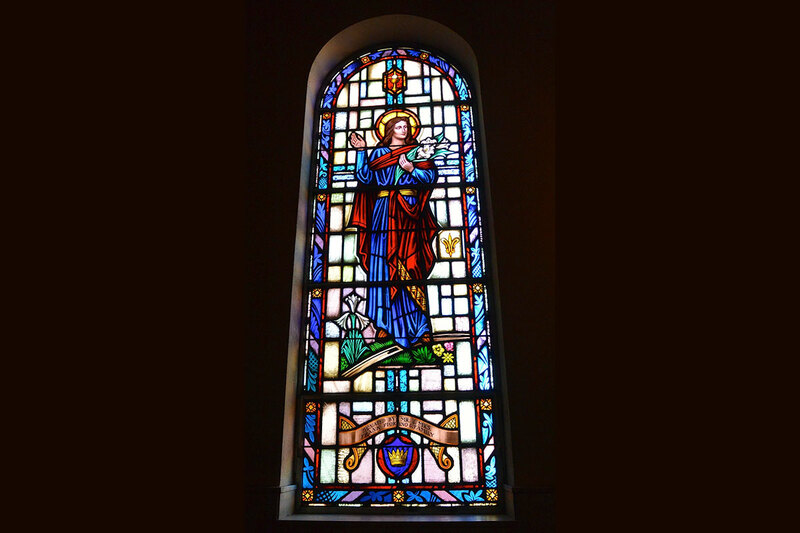 St. Genevieve’s feast day is January 3. Let us remember to pray to God in all things. St. Isaac Jogues is dressed in the black robes of the Jesuits, holding a cross and a book of the Gospels with a tomahawk at his feet. St. Isaac was a devoted missionary to the North American Indians despite great hardship and torture by other tribes who were convinced that he was a sorcerer. He was martyred and remembered with the “North American Martyrs”. 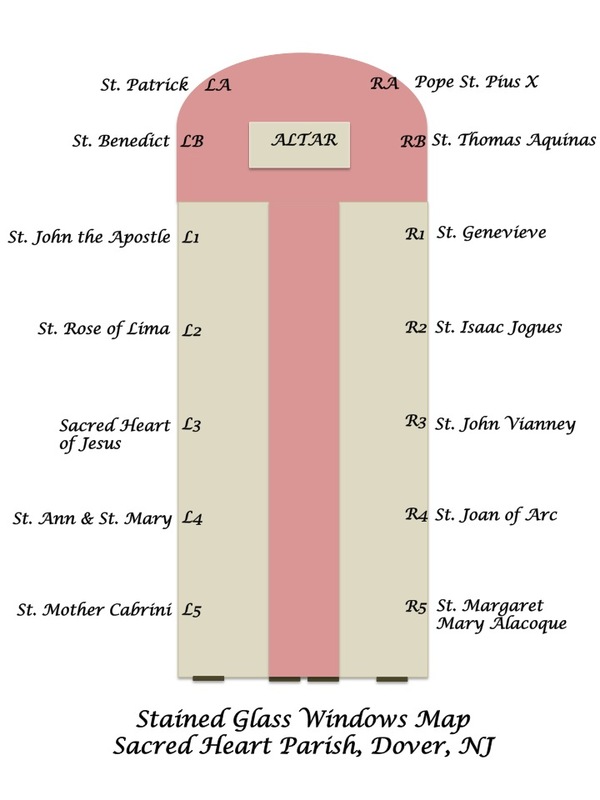 Their feast day is collectively October 19. 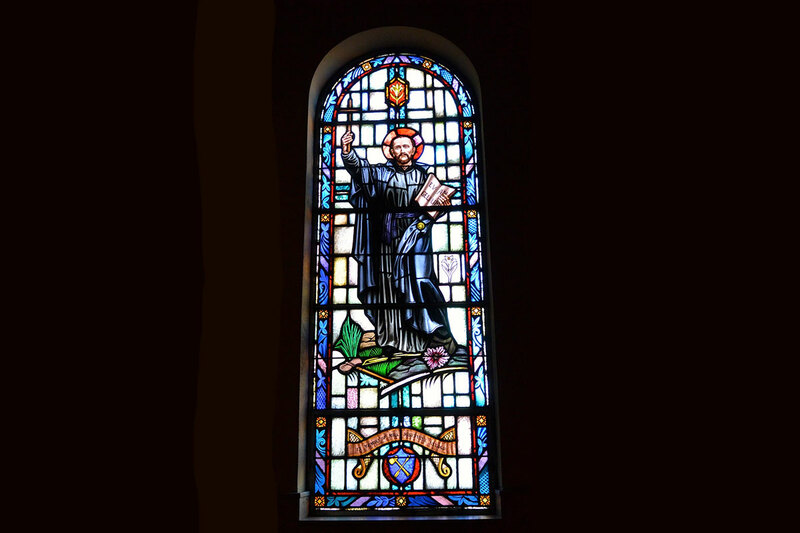 St. John Vianney, also known as the Cure d’Ars, was a confessor and priest who would spend hours hearing confessions, once for three days continuously. He is the patron saint of priests and confessors. His feast day is August 4. Remember to always pray for the priest who will be hearing your confession! 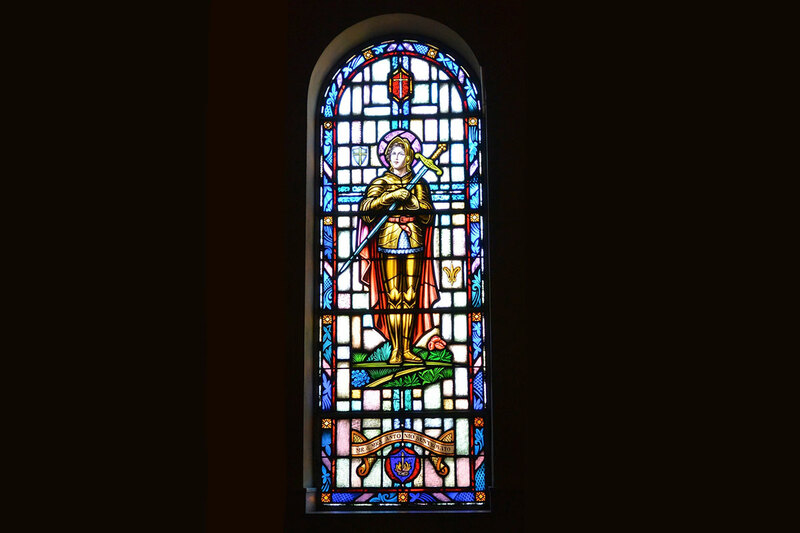 St. Joan of Arc is dressed in golden armor holding sword. She rallied the French troops against the British near the end of the Hundred Years’ War. She was captured, tried, and burned at the stake by a court of pro-British and Burgundian clerics. Later, she was re-tried by Pope Callixtus III, who found the trial illegal and declared her innocent of heresy. 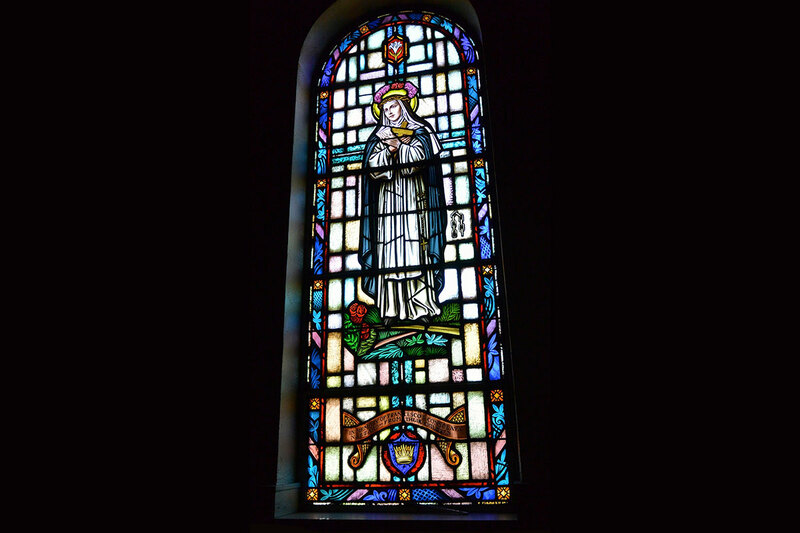 She is one of nine secondary patron saints of France, and is patroness particularly of military personnel (especially women), martyrs, captives, and those who are ridiculed for their faith. Her feast day is May 30. St. Margaret Mary Alacoque, dressed in a black and blue habit, is holding the image of the Sacred Heart of Jesus. She was a French nun who promoted the devotion to the Sacred Heart in its modern form. She is the patroness of those suffering with polio, those who have lost their parents and those devoted to the Sacred Heart. Her feast day is October 16.